Shelly Stokes has the rare combination of artistic talent and business acumen. 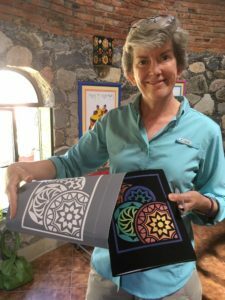 After several personal residencies, Shelly and her husband have relocated to Lake Chapala from Minnesota. 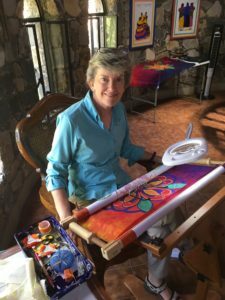 We caught up with Shelly as she is adjusting to her retirement as a Paintstik distributor and educator in the US to her new life as a full-time fiber artist in Mexico. 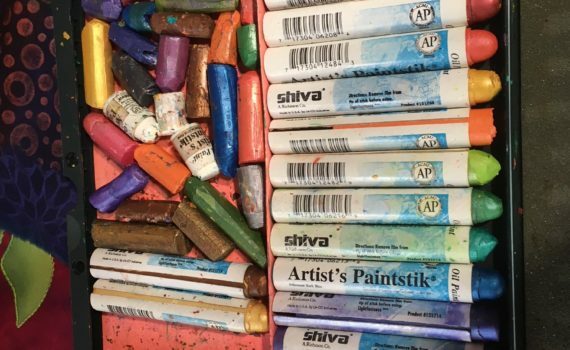 As a result of distributing Shiva Paintstiks, you became a major player in the US quilting and fiber art market. Tell us some of the history of Paintstiks and how you became the US distributor. When I discovered Paintstiks almost 20 years ago, I fell in love with the product. It is a solid wax-based oil paint with a fabric-friendly formula – a “grown-up” crayon, if you will. 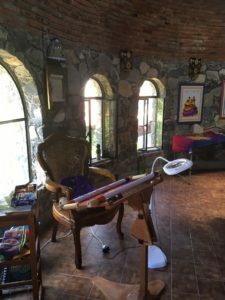 It’s permanent and allows the artist to draw, paint or stencil their designs onto fabric and then use that fabric for art quilting and other fiber projects. The paint was great, but it was difficult to order supplies. When I approached the manufacturer, they asked me if I would like to be their distributor for the quilting market. I didn’t hesitate to say yes. I wrote the first book about how to use Paintstiks, took the book and paints to Quilt Market, and the business took off. Over the years, I sold more than 30,000 copies of “Paintstiks on Fabric”, developed two lines of accessory products, wrote two additional books and taught workshops. Most recently, I made a switch to online teaching, which allows me to teach from any location. Most artists have day jobs to support their art or find themselves in small businesses. You probably have some words of wisdom for them. Like most business owners, I have learned a lot by the seat of my pants and would be happy for others to benefit from my mistakes and successes. Step back from the daily crush of work and pay attention to changes in market trends. Take time to make a business and marketing plan. Get an experienced business coach. They are worth their weight in gold. Know when to stop, move on, or reinvent yourself. Find a balance between work, play and creativity. You need all of them to thrive. What brought you to Chapala and why did you decide to move here from Minnesota? I had dear friend who moved here and loved the area. When I visited her, I could see that this was a real community, not a tourist town. It reminds my husband of St. Paul in the 1940s and 50s. (I was not around yet, so I have to take his word for it!) I love that we don’t need a car and the cost of living is less than half of what it is in Minnesota. I’ve lost 10 lbs just walking to the market every day! It’s a slower lifestyle and people are never too busy to say hello. And then there’s the weather… It may not be perfect here but it’s darn close! How has living in Mexico affected your work? I love the strong colors and intense Mexican light. For years I have loved Talavera ceramics, especially the pieces with bright colors on dark backgrounds. In my current work, I borrow design motifs from Talavera plates and pottery, refine the images, and rotate and repeat patterns to create new designs. After painting the images on fabric, I add embroidery and beading. 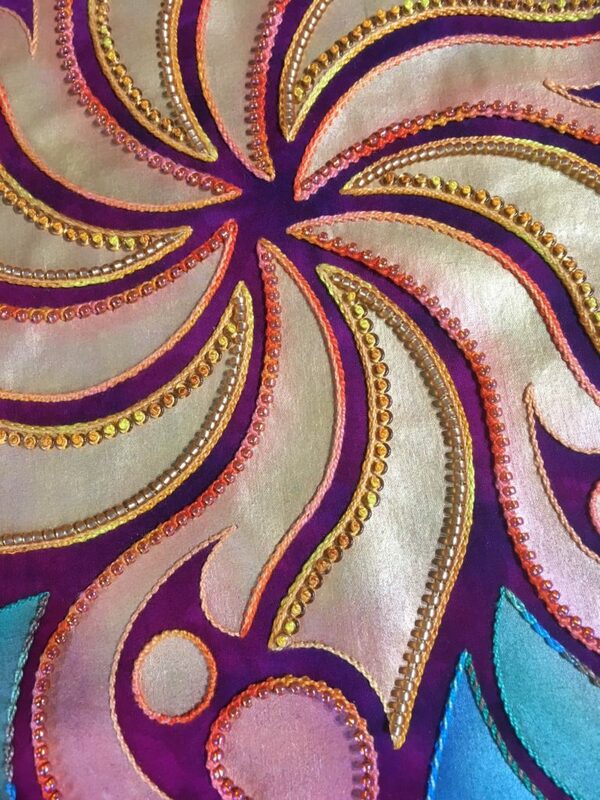 While they are time intensive, I love the meditative nature of hand stitching and beading. With more time on my hands, it is tempting to explore new things. 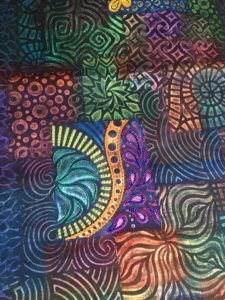 But, having spent almost 20 years with Paintstiks and fabric, I’m excited to continue my intimate working relationship with a small set of materials – and to see what creative opportunities will cross my path. There is a theme emerging as you tell your story. You have taken many leaps of faith in your life. Tell us more about this thread. Like many of your readers, I was encouraged to get a good job rather than be an artist. So I went into engineering and I’m comfortable in the tech world. 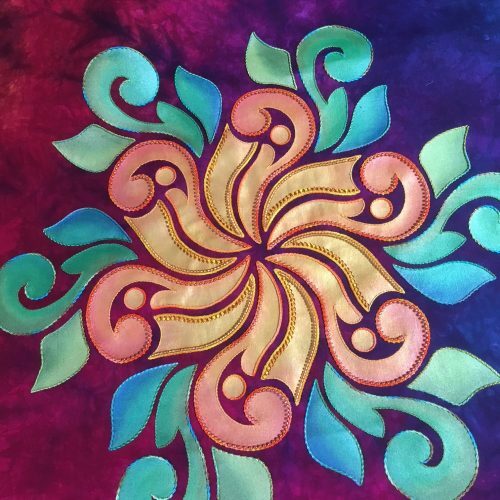 When my husband retired, his financial stability enabled me to take a leap and leave my tech career and find a home in the world of quilts and fabric art. When the Paintstik manufacturer offered me the distributorship, I leapt at that chance and built a high six-figure business. When I was in desperate need of a change, I closed out the product side of the business and turned to online teaching. 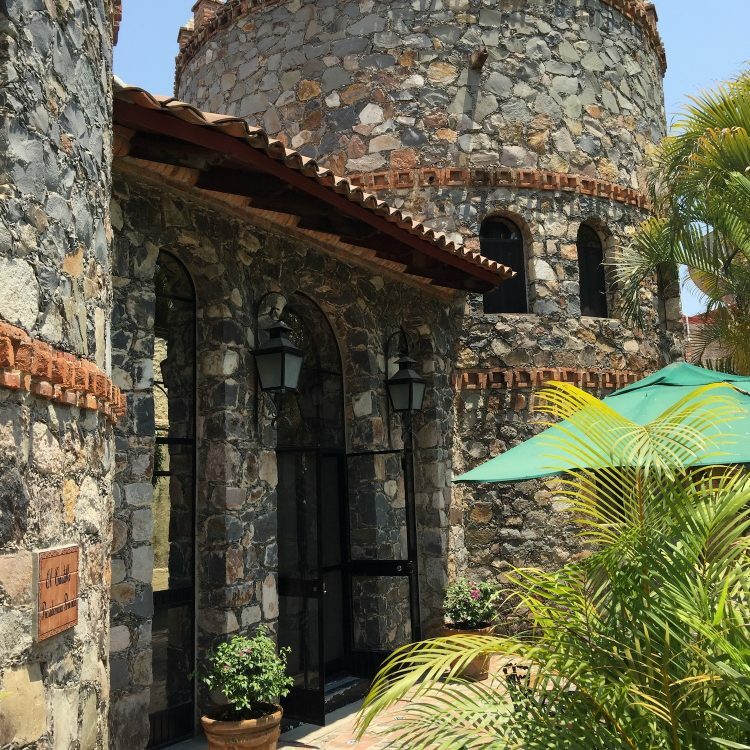 When a castle came up for sale in Chapala, I took another leap of faith, bought it, and decided to move to Mexico. The lesson? If you hold on too tight to your current situation, you might not be open to letting yourself grab onto other, better possibilities. Listen to the voice in your head and to your gut. They are probably right. 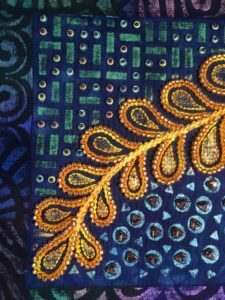 Do you have any parting thoughts or advice for artists, especially fiber artists? Find a balance between giving and receiving. Make time for yourself to recharge, explore other media, dive deeply into your work (take a personal residency!). Defend and honor the importance of your creative work. Follow your creative spirit. Come into alignment with yourself. Only you know what that means. Trust your instincts and take risks!